The General Motors EV1 is certainly not the first GM electric car made. It is the first specially designed and manufactured electric car by General Motors and made available to consumers, through a GMAC lease plan, in Southern California and Arizona. Conventional internal combustion engine propelled vehicles requires a network of gas station and electric car needs charging points not just at the owner's home. General Motors had developed a partnership with Edison EV to further develop the charger infrastructure in all four targeted markets. General Motors also wanted to be ready for the California Air Resources Board (Carb) which in 1990 took drastic action to address the chronic smog problem of the Los Angeles area passing the controversial Zero-Emission Vehicles (ZEV) Mandate; this said that zero-emission vehicles should account gradually for two percent of all cars sold in 1998, then five percent in 2001 and 10 percent by 2003. Under the intense pressure by the car manufacturers, the mandate was slowly modified then dropped. 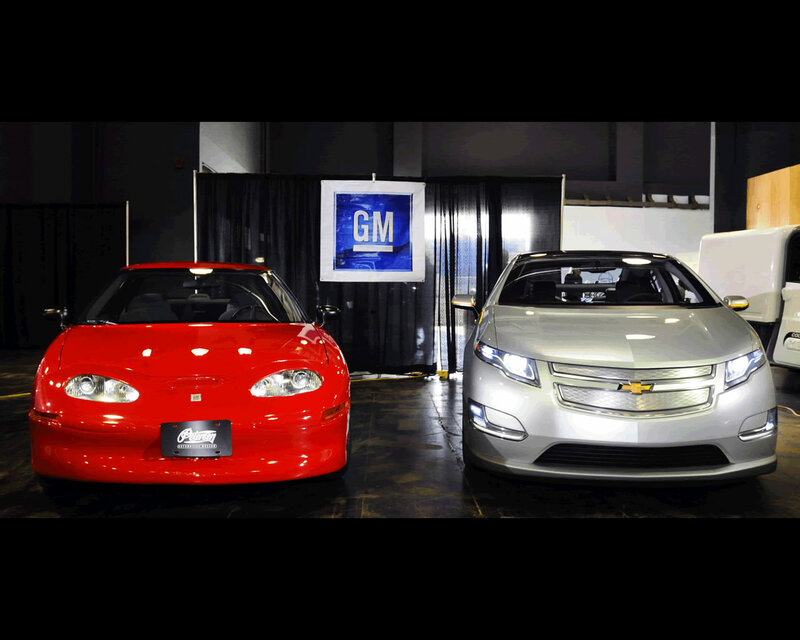 The GM EV1 program continued with some success, till it was dropped at the end of the leasing contracts. 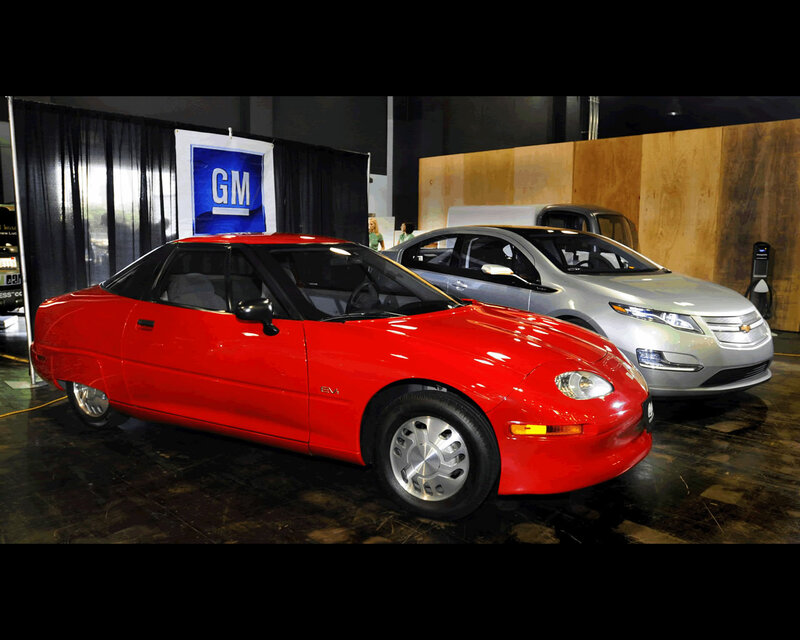 The GM EV1 remains a milestone in the electric car history. One can see that 2010 Chevrolet Volt program has a very similar layout of main components, in particular, the battery pack, the heaviest portion of the vehicle, located right in the middle of the platform between the seats. General Motors have been developing alternative powertrain for automobiles during decades and electric propulsion has been evaluated since 1964 with the Electrovair I, a Chevrolet Corvair conversion, with 90 hp AC induction motor, silicon controlled rectifier( SCR) inverter and 450 volt silver-zinc battery pack. In 1966, Electrovair II was developed with 115 hp AC induction motor, SCR inverter and 530 volt silver-zinc battery pack. In 1969-1972, GM engineers collaborated in the Lunar Rover vehicles built for the Apollo Program with Boeing as the prime contractor. These electric vehicles used a motor at each wheel, had four-wheel steering and used a non-rechargeable battery. Three of these vehicles are still on the moon, left behind by Apollo 15, 16 and 17 astronauts. In 1977, the Electrovette, a Chevrolet Chevette conversion demonstrated nickel-zinc battery technology and launched a program to design and develop a production electric vehicle. In 1980, twelve Chevette conversions were built by the EV Project Centre to evaluate the Nickel-Zinc batteries and electric propulsion system. The 120 volt battery pack contained 72 cells and the DC motor was rated at 33 hp. The range was 60 miles on the EPA city schedule. Between 1980 and 1982, ground-up electric vehicle wer being designed by General Motors Electric Vehicle Project Center. The program terminated when the nickel-zinc battery was not able to meet the required specifications. On January 3rd 1990, the Impact electric vehicle was announced at the Los Angeles Auto Show. The response was phenomenal. This was the 1st generation vehicle and is presently on display at EPCOT in Orlando, Florida. On April 18th, General Motors announced that it was forming a group that would be charged a production version of the Impact show car. During 1990 and 1991 several Geo Storms and Chevrolet Lumina APV were converted to electric vehicles using Impact show car propulsion system for test and development of propulsion and braking systems. One Storm EV was dedicated as an electric vehicle demonstrator to provide the first EV experience to many people. In 1992 the "Fast Build" Impact, made in just 99 days, demonstrated the GMEV designed vehicle. It was the first POC, or proof of concept, vehicle that integrated all of the systems being deigned and developed. This was the second generation vehicle. During 1992 and 1993, twelve additional POC Impacts were built as engineering test and development vehicles. One of these vehicles was dedicated to consumer marketing and communications projects. These were GM 3rd generation vehicle design. Between 1993 and 1994 fifty PrEView Impacts were built at the GM Tech Center. These were the fouth generation vehicle design and were being used in the PrEView drive program and for test and development. On March 11th 1994, a specially prepared Impact established new world speed records for electric vehicles at Fort Stockton, Texas, test track at 183.822 miles per hour (295,83 kph). In June 1994, the PrEView Drive Program is launched. Several hundred drivers use the vehicles for two week periods in 11 cities. This is a cooperative program with 14 electric utilities and will be concluded in December 1996. In 1995, the production line was alive. In March, the Lansing Craft Centre began building the 5th generation Impact vehicles just 365 days after the program was started. Thirty four vehicles were built during the year- refining the manufacturing processes and providing additional test and development vehicles. On January 4th and 5th 1996, the Impact electric car was announced under the new name EV1 at the Los Angeles and Detroit Auto Shows. The vehicle will be available in the last half of the year. On October 15th 1996, Saturn Corporation announced that the EV1 would be offered to consumers through a 36 month GMAC lease at a capitalized lease cost of $ 33.995. This capitalized lease cost can be reduced by available federal, state and local subsidies. December 5th 1996 marks the first day of EV1 deliveries to consumers through the 24 Saturn retailers serving the great Los Angeles, San Diego, Phoenix and Tucson markets. General Motors, with the EV1, is the first major automaker in modern times to have marketed a specifically designed electric vehicles to the public. General Motors has invested over $ 350 million in the EV1 program. "Overall I'd characterize the project as an engineer's dream," declared at the time Jim Ellis, EV1 Director of Engineering, "because it was an extreme technical challenge." From the start, the object was to build not just an electric vehicle that could be offered for sale, but an electric vehicle that the public would really want to buy. Which meant it had to perform like other vehicles. Provide the same kind of safety, comfort and convenience features. And yet still offer the type of range most people thought impossible in an electric vehicle. Besides all possible advantages the battery remains the main challenge with high weight and long charging times. By the figures available, we can guess ll70 lbs (about 530 kg) for the 26 modules Valve Regulated Lead Acid battery pack. All the other elements were improved to the lightest weight and aerodynamic properties, even the tires are ultra low rolling resistance. The welded and bonded aluminum alloy spaceframe weights a mere 290 lbs (132 kg), The majority of the mechanical elements are made of aluminum, the driver seat has a magnesium structure and the bodywork is made of plastic pieces. The body shape has been optimized with an exceptional aerodynamic drag coefficient of 0.19. Yet the EV1 is fully equipped with air conditioning (heat pump system) , AM/FM stereo system with Compact Disc/Cassette player and 4 speakers. Safety features are also fully equipped with driver and passenger front airbags, anti lock braking, traction control, inductive coupled charging system with no contact metal to metal. The propulsion system of the EV1 is based on a three phase alternating current induction motor integrated into a drive unit that contains a two stage gear reduction and differential. The propulsion power is 102 kW (137 hp) and torque measured at the motor is 150 Nm (110 lb-ft)@ 0 to 7.000 rpm. Estimated energy consumption is 30 kW/mile in city and 25 kW/mile on highway giving an estimated cruising range of 80 miles (129 km) in combined city/highway cycle depending on accessory usage, terrain, temperature and driving style. The EV1 accelerates from 0 to 60 mph (96 kph) in under 9 seconds and the top speed is electronically regulated to 80 mph (129 kph). The electric motor operates as a generator during coasting and recharges the batteries. The EV1 gets its energy from 26 valve regulated lead acid batteries. The batteries are completely recyclable within the existing infrastructure. All the electrolyte is stored in absorbent pads between the battery plates, minimizing the risk of leakage in an accident. The 312 volt electrical system uses special high current connection systems for safety and electromagnetic shielding. One of the most innovative features is the Magne Charge Inductive Charger and Charge Port. The charger has no direct electrical connection to the vehicle. The user inserts a lightweight, weatherproof plastic covered paddle into the vehicle's Charge Port on the front end. Power is transferred via a magnetic field. Recharging the batteries at 220/30 Amps takes approximately 3 hours. In January 1998, General Motors has opened the next chapter of the electric vehicle story with a field test of 30 Chevrolet S-10 Electric pickup trucks and GM EV1 equipped with new, advanced technology GM Ovonic Nickel Metal Hybride (NiMH) batteries. After this NiMH Field Test deployed in partnership with regional utilities, GM's NiMH powered EV1 were offered in addition to their lead acid powered counterparts. With the introduction of these batteries, GM EV1 offer both the greatest driving range and product option range. The NiMH batteries enable the EV1 to travel up to 160 miles (257 km). With NiMH, the cathode is a nickel compound and the anode consists of vanadium, titanium, zirconium, nickel and chromium alloyed to create a metal hydride (microscopic lattice structure containing hydrogen). The electrolyte is a strong alkaline solution of potassium hydroxide (KOH) and water. Both electrodes and the electrolyte are sealed within a stainless steel case. The energy performance per unit mass and volume is where NiMH batteries demonstrate a major advantage over any lead acid design. Specific power is generally quoted in watts per kilogram (W/kg) - the power available per unit mass. The NiMH batteries have equivalent specific power to the EV1's lead acid batteries. In over the road performance, specific power correlates most directly to acceleration performance. The switch from lead acid to NiMH batteries means that the EV1 will continue to have spirited responsiveness. Specific energy is quoted in watt-hours per kilogram (Wh/kg). Here the NiMH battery doubles lead acid ratings with 70 versus 35 Wh/kg. The specific energy of a battery pack is directly proportional to an electric car's over the road range (all other factors such as weight, aerodynamic drag, and propulsion efficiency being equal. In other words, EV1s powered by NiMH batteries can realistically expect twice the range of their predecessors between recharge. NiMH also offer a cycle life three times better than lead acid batteries. In addition, NiMH batteries accept high rate charging very well; thus 15 or 20 minutes at 50 kW might be enough to boost the state of charge to the 80 percent level under optimum conditions. In 1998, NiMH batteries have only begun reaching the commercialization stage for automobiles because they are more expensive to produce than lead acid batteries. At the time, GM Ovonic L.L.C., supplier of the NiMH batteries, has been awarded a contract by the United States Advanced Battery Consortium to focus on reducing the cost of this technology. Cost, Weight and Charging time remained the key challenge for the electric car to reach mass production; the charging points network hurdle is another limitation that call for partnership with Electric Power Companies. Dimensions: Length 169.65 in (4.309 mm), Width 69.5 in (1.767 mm), Height 50.65 in (1.286 mm), Wheelbase 98.89 in (2.512 mm), Curb weight 2970 lb (1350 kg), Weight minus battery pack under 1.800 lb. (816,5 kg), aluminum structure weight 290 lbs (132 kg).